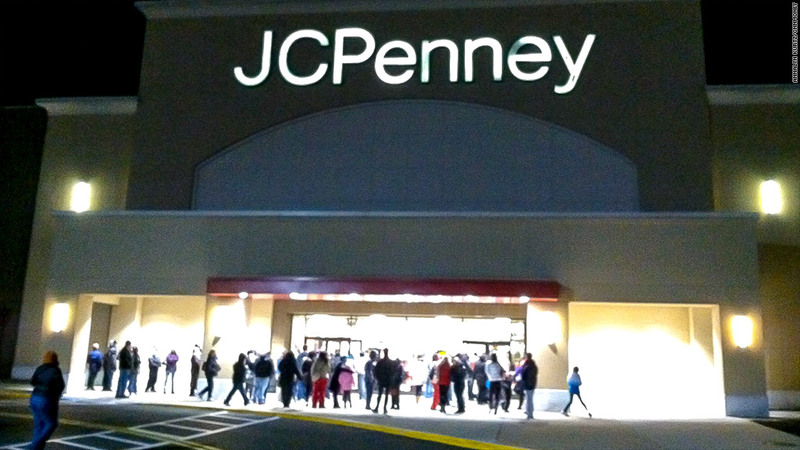 Shoppers headed to a J.C. Penney store in New Jersey on Thanksgiving seeking early Black Friday deals. After a tough year, Black Friday is J.C. Penney's do-or-die moment, and so far, the retailer is showing mild signs of life. On Thursday night, the parking lot at a store in Wayne, N.J., was sparse an hour before opening at 8 p.m. Meanwhile, a few miles away lines had already wrapped around Best Buy (BBY) and Target (TGT). But minutes before the store opened, about 100 people suddenly showed up, with most heading straight to the shoe section. "So far, I have seven pairs," said Geraldine Jaquez, her arms piled high with boxes of boots. 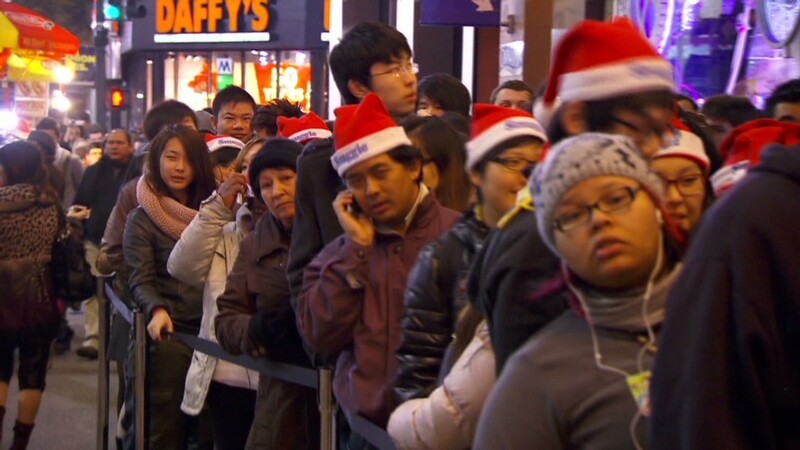 "I've never done Black Friday before, but I like these earlier hours because there's not as much traffic." Like many of its competitors, J.C. Penney (JCP) opened at 8 p.m. on Thanksgiving this year -- its earliest Black Friday opening ever. While the turnout was modest, the Thursday opening brought in budget shoppers who kept trickling in as the night went on. Some had saved up months in advance, preparing to score deals this night. "I love J.C. Penney. It's awesome. Their regular prices are like sale prices and then to get sales on top of that is a real deal," said Collin Cook, who planned to spend about $350 on gifts for family, women's clothing and maybe some diamond stud earrings for $79.99. J.C. Penney is hoping for strong sales this holiday, a season when retailers typically earn the bulk of their annual profits. J.C. Penney has been focused on damage control after former CEO Ron Johnson's plan to revolutionize the company backfired. Instead, it alienated longtime customers by eliminating discounts, getting rid of house brands and changing store design to appeal to younger shoppers. Johnson was ousted in April, and J.C. Penney has been working to lure back customers ever since. Discounts returned in a big way as the retailer focused on clearing out inventory that wasn't resonating with customers. On Thanksgiving night, the store offered deep discounts -- 80% off St. John's Bay puffer coats, 70% off many juniors dresses, and Samsonite luggage marked down to $159.99 from $400. "We're very excited to see our customers are responding and we're definitely seeing customers coming back to the old J.C. Penney they were used to," said Store Leader Susie Schaechner. At his store location in Great Falls, Mont., manager Edward Larson said the switch back to traditional discounts worked in a big way. Each buyer spent more money, with coats, bedding and T-shirts topping the list. "We're selling more units per customer than last year," Larson said. Turnarounds are tough, though. With many items on clearance, the company's profit margins have been squeezed, sending its stock down about 48% from a year ago. Retail comebacks are hard to pull off, but not unprecedented. About a year ago, Best Buy was struggling to compete with Amazon (AMZN). Analysts were even predicting a bankruptcy. Things picked up after new CEO Herbert Joly entered the picture. Now, Best Buy shares are up more than 200% over last year. Will J.C. Penney be the next retailer to engineer a comeback? It's still too soon to be sure, but there are signs the company may be turning a corner. "I'm a little more optimistic than I would have been two months ago. When I go to the store, I'm starting to see things normalize a bit," said Brian Sozzi, CEO and Chief Equities Strategist with Belus Capital Advisors. "The traffic on weekends seems to be improving. There are some signs of life there." Earlier this month, the company announced its October sales rose from a year earlier -- the first time that's happened in nearly two years. And Black Friday customers certainly like the deals. "I don't like shopping. I hate it," said Jenny Acuna. "But I like J.C. Penney. The prices are reasonable."